Biopsies are a gold standard for definitively diagnosing diseases like cancer. Usually, doctors can only take two-dimensional snapshots of the tissue, and they're limited in their ability to measure the protein levels that might better explain a diagnosis. 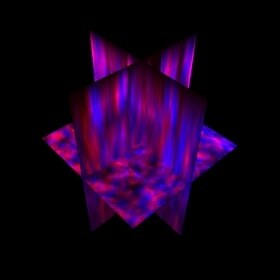 But now, researchers have developed a new method to acquire three-dimensional atlases of tissue that provide much more information, incorporating both data on the tissue structure and its molecular profile. They report their results in the journal Biomicrofluidics, from AIP Publishing. "Sometimes, it's not obvious from a single two-dimensional slice whether there's local metastasis taking place," said Jeremiah Zartman, an assistant professor in the Department of Chemical and Biomolecular Engineering at the University of Notre Dame. "Having additional three-dimensional information could make things less ambiguous in some cases." In conventional methods, pathologists typically take thin, two-dimensional slices of the tissue and use hematoxylin and eosin (H&E) to stain the cells. Hematoxylin turns nuclei blue while eosin turns other cellular components pink, enabling doctors to see cellular structure and identify signs of cancer. It's the gold standard for diagnosing cancer and other diseases, Zartman said. But it has limitations. A flat image can't reveal anything about the shape and curvature of the tissue, and the process unavoidably destroys some of the sample. Sometimes there isn't much of the sample, and doctors may want to limit the amount because biopsies can be painful for the patient. Two-dimensional slices also limit how much information can be extracted. If clinicians or researchers want to identify the location of specific proteins by tagging them with a dye, for example, they can only do so for a few at a time due to the limitations of fluorescent microscopes. If they want data on additional proteins, they would need yet another slice. The new technique, however, avoids these shortcomings. It's a microfluidic approach, in which the sample is put inside a tiny chamber on a clear chip not much bigger than a dime. The enclosure lets the tissue maintain its shape and structure, which enables multiple rounds of staining and imaging. Narrow channels allow chemical solutions to be injected into the tissue. Those solutions enable doctors or researchers to peer into the tissue. First, they have to remove lipids, a type of fatty molecule that makes the tissue opaque. Then, they can use fluorescent dyes to tag specific proteins that could be markers for diseases. Because the sample is preserved in the chip, researchers can clear those stains, using a method called quenching, and tag another set of proteins. In principle, Zartman said, researchers can repeat this process and produce a rainbow of colors that identify the relative amounts of dozens of proteins within cells throughout the whole tissue. The chip also provides long-term storage of the sample, allowing for analysis at a much later time. Its compact size requires smaller amounts of chemicals, which could potentially cut costs. Future designs will include control devices to automate the staining analysis. The doctor or researcher would simply take the chip and insert it into their instruments, turn it on, and collect the data. While the individual aspects of the method aren't new, its uniqueness comes from putting everything together. "It's combining different approaches into a single platform in order to enable three-dimensional imaging of microbiopsies providing a rich data set," Zartman said. So far, a team of researchers, including David Hoelzle, Siyuan Zhang and Zartman, all of whom are at Notre Dame, have done a proof-of-principle demonstration. Their experiments, in which they used different stains on multiple kinds of mice tissue, show that the three-dimensional images can be made into slices that qualitatively match conventional images of biopsies—making the transition to the new technique easier. The researchers are now modifying the process to work with other archived tissues, developing an automated process, and plan to stain more proteins at once to provide a detailed map that conveys both cell shapes and protein levels within the tissue.